Shambhala is a global network of people from all walks of life, dedicated to the principle that every human being has a fundamental nature of basic goodness. This nature can be developed in daily life so that it radiates out to family, friends, community and society. Over the centuries, the Shambhala teachings on human dignity have been kept alive and are now being shared and studied worldwide. Millions have read and treasured the Shambhala teachings. They have been translated into more than a dozen languages – in live teachings, recordings, books and online broadcasts. More than 100,000 people in 94 countries have attended in-depth programs to discover the principles of Shambhala. 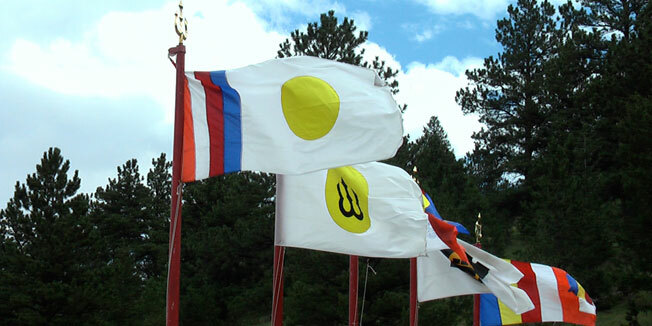 There are now over 200 Shambhala communities, located in major cities, towns and rural settings. These groups practise, study and work together as a community to explore ways of manifesting dignity and sanity in an increasingly chaotic and stressful world. According to the Shambhala tradition, we are living through an age of greed and aggression. We harm ourselves, each other and our planet. These teachings begin with the understanding that all beings are basically good, and that life is worth living. We call this a path of spiritual warriorship, which here means living a life of fearlessness, gentleness, and intelligence. The Shambhala teachings emphasize being in the world, and bringing together everyday life, work, family, and social action with the path of meditation. The teachings focus on how to help this world. In essence, Shambhala is about living a full human life, right in the midst of challenges. In action, Shambhala is a spiritual path of study and meditation that helps us work with our minds, as well as a path of serving others and engaging with our world. These vital and timely teachings open the door to the compassionate care of ourselves and others.